Rugged. Roomy. Off-road ready. There’s so much to love about the 2018 Jeep Cherokee, from the show-stopping exterior style to the trail-ready capability. This crossover SUV manages to serve the purpose of being both a regal luxury vehicle and a trailblazing monster all at the same time, and you can find it and Landers Chrysler Dodge Jeep Ram in Norman, Oklahoma. Landers CDJR of Norman customers come in from across the Oklahoma City metro, including Edmond, Moore, Midwest City, Yukon and Del City. Treat yourself for once — stop by and take the 2018 Jeep Cherokee out for a thrilling test drive. Take one look at the 2018 Jeep Cherokee, and you’ll already know that this vehicle was designed with world-class craftsmanship. The style catches your eye with a beautifully sculpted and aerodynamic appearance. The exterior puts a modernized spin on the traditional Jeep design, featuring familiar touches like the signature seven-slot grille and trapezoidal wheel arches. You can opt for available features to enhance the styling of your Cherokee too, like dual chrome exhaust tips. Even the Cherokee’s lighting is perfectly placed for the optimal effect. The signature LED daytime running lamps sweep back for a fluid and dynamic look, while the high-intensity discharge headlamps and fog lamps light up the night. True to the Jeep vibe, the inside of the 2018 Jeep Cherokee was inspired by nature. It features the natural hues of some of the most iconic landscapes, from the Grand Canyon to the mysterious Morocco. The Cherokee’s seating features premium materials and modern additions like heating and ventilating technology. The front seats are also eight-way power adjustable with four-way power lumbar support. When you need a little flexibility, you can count on the 60/40 split-folding rear seat and available fold-flat front passenger seat to make room for the kayak, new crib or whatever you need to haul. Plus, the available power liftgate makes loading up the car a breeze. For the smaller items you need to take on your journey, the 2018 Cherokee has smart storage solutions strategically placed throughout the cabin, like the dash-mounted covered storage for your valuables. The award-winning UConnect technology gives you hands-free convenience for all your calling, listening and navigating needs. The 2018 Jeep Cherokee Trailhawk is a monster on the trails. The Trailhawk trim wears the Trail Rated badge, which means it is capable enough to perform well under a variety of different off-road conditions. The available Jeep Active Drive 4×4 systems help ensure that every tire has the right about of traction exactly when it’s needed. The Trailhawk has up to 20 inches of water fording ability, so you can power through the streams and waterholes that stop everyone else in their tracks. When you need to get over those above-ground hurdles, you won’t have to question whether your Cherokee can handle the job. With optimized maneuverability, articulation and ground clearance, the 2018 Jeep Cherokee Trailhawk can flex, climb and crawl over the most daunting obstacles like fallen trees or hefty boulders. No matter what your particular brand of adventure is, there’s a 2018 Jeep Cherokee made for you and your lifestyle. 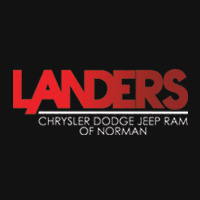 Landers Chrysler Dodge Jeep Ram in Norman, Oklahoma has plenty of Cherokees in stock that you can explore and take out for a test drive. Give us a call, swing by or check out our online inventory to start your Cherokee journey.